90 million in private finance, though it has only released one test versus its product. Other crypto-focused investors, such as Multicoin Capital and Scalar Capital, also bought Dfinity tokens in this "pre-sale round," which valued the company at $ 1.9 billion. Dominic Williams is the head of the project, and he has no lack of self-confidence. "I have a pretty strong technical background," he tells Forbes . "Long ago, I graduated from my computer science class at King's College in London." After graduating in 1995, he became a serial tech entrepreneur. He finally launched an online multiplayer "Fight My Monster" game that won millions of users. In 2014, he began working on algorithms for crypto currency platforms, and the next year he designed the technological theory behind Dfinity. In 2016, he founded Dfinity as a nonprofit foundation based in Zurich and eventually opened an office in Palo Alto, which became his largest location. What business problem is Dfinity trying to solve? Williams says Silicon Valley tech companies are so big and powerful that they stifle innovation for startups. He cites examples like Zynga, creator of the Farmville game, which once had more than 200 million users. It has fallen out of favor after Facebook changed its newsfeed algorithm and stifled its growth. "I know some startups that have built on Salesforce, and now they've got colossal service bills that affect their profitability," adds Williams. Dfinity's platform is theoretically neutral and unbiased, driven not by an organization but by a distributed computer network. Its goal of becoming a general-purpose computing platform is to outperform established products such as Amazon Web Services and Google Cloud. Williams says the Dfinity architecture makes it safer and more efficient for engineers to build on, in part because it reduces the time it takes to coordinate different moving parts of an application. But why does a startup with 43 employees need so much money? Dfinity expects the $ 102 million to last for "a few years". Williams believes the company will grow to nearly 200 in 12 months, and pays top dollars for talent in areas such as cryptography, programming languages ​​and distributed computing. The Dfinity salaries are "on par" with other organizations like Google, which are seeking top talent, Williams says. 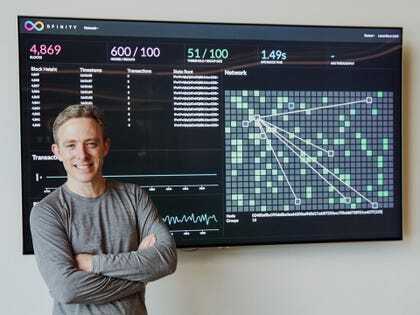 "If you're a machine learning specialist or a cryptography specialist, it's kind of like an NBA star," says Chris Dixon, investor and partner of Dfinity at Andreessen Horowitz, a $ 300 million crypto fund. Google has given top engineers millions of dollars in premiums. Dfinity is the biggest bet so far of the crypto a16z, and Dixon is very excited about the people behind the project. "The group of people Dominic has put together in recent years is by far one of the most impressive teams we have met in this area," Dixon wrote in a blog post. For example, Williams hired Andreas Rossberg, the co-designer of WebAssembly, a technology that runs in today's top internet browsers to make them faster. "WebAssembly is probably one of the key technologies of the current decade," says Dixon. Another important reason why investors support Dfinity is a technology breakthrough called "threshold relay". It was developed by Williams and processes transactions faster than platforms like Ethereum. In the meantime, it seeks to maintain a secure, "trustless" system that is spread across thousands of computers and does not require a single, centralized authority review. Industry experts see Dfinity's technology as promising. Will Martino founded Kadena, another organization that develops a crypto platform with faster transaction speeds. "There are only a few really practical visions for the place and they are one of them," he says. "Among the candidates coming into the Ethereum room, Dfinity is probably the strongest," says Joe Lubin, a co-founder of Ethereum and head of blockchain consulting firm and crypto startup incubator ConsenSys. Dfinity investors justify the nearly $ 2 billion valuation by pointing to the global business market that Dfinity can address, which is in the trillion, according to Dixon and Multicoin Capital partner Kyle Samani. But until the product launches in the wild and is tested against actual use, nothing is guaranteed – especially in cryptography. Dfinity plans to publicly release the platform in late 2018 or early 2019. In less than two years, Dfinity has unbelievable $ 190 million in private He has collected funding even though he has just released a trial version of his product. Other crypto-focused investors, such as Multicoin Capital and Scalar Capital, also bought Dfinity tokens in this "pre-sale round," which valued the company at $ 1.9 billion. Dominic Williams is the head of the project, and he has no lack of self-confidence. "I have a pretty strong technical background," he tells Forbes . "Long ago, I finished at the top of my computer science class [at King’s College London]." Dfinity investors justify the nearly $ 2 billion valuation by pointing to the global business market that Dfinity can address, which is in the trillion, according to Dixon and Multicoin Capital partner Kyle Samani. But until the product launches in the wild and is tested against its actual use, nothing is guaranteed – especially in cryptography. Dfinity plans to publicly release the platform in late 2018 or early 2019.